You're starting to look into online backup, file sync, secure file transfer, and online collaboration services, but you still can't get over your reluctance to entrust your critical workflow to a third-party server. What if something goes wrong? What if the cloud has a distinctly un-silver lining? What if the service gets hacked? How high would you jump for joy if I told you that you could have all of these features, and much more, in a solution that's centrally managed and hosted in-house? It's called PowerFolder Server Starter! PowerFolder Server Starter lets you host and manage your data in a way that makes the most sense for your business. Backup your files, sync versions, transfer data securely, even work with others online, without worrying about going outside of your own network! 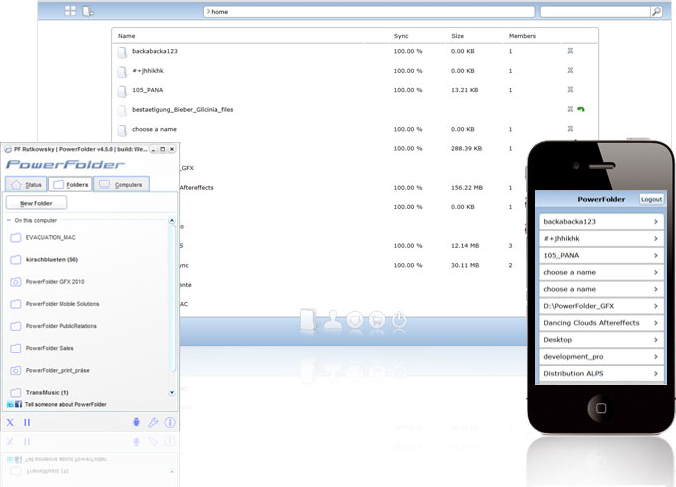 Using an innovative web interface, PowerFolder Server Starter lets you share and access any of your data using any web browser, anywhere, and administrators can grant and revoke access to individual users quickly and easily. And you never have to worry about accidental overwrites and deletions, because PowerFolder Server Starter lets you restore previous versions of files! Getting started with PowerFolder Server Starter is a no-brainer. Auto-configuration of server connections and online license key activations means you're up and running faster than with any other product. Authenticate users using LDAP or Active Directory. Storage usage reports keep you up to date on which users are being resource hogs. And if you're the capitalist sort, you can even implement an E-Commerce module that lets you sell space on your network and receive licensing payments via PayPal! The best part of PowerFolder Server Starter is the ability to brand the program interface, installer, and web interface in your own corporate look and feel! Your users will think you've slaved over hot code for weeks, but they'll never guess that your secret is PowerFolder Server Starter! After you purchase PowerFolder Server Starter, it may be used for 12 months. After you purchase PowerFolder Server Starter it may be used for 12 months and will not function after that unless you renew your subscription. PowerFolder Server Starter is licensed per server. Gerad Schmidt Sounds like an inhouse dropbox. So with this server I'm able to run my own file sync for my clients? Bernhard Rutkowsky yes you can run it on your own servers and become independent from our infrastructure and network the only connection you need is to the license service at least once a year, but this is a connection which does not interact with your encrypted file exchange, so we will never get in touch with any data. the clients can sync with your server or directly between each other. please feel free to test it we have 20 day trial of the server on our page and all you need to test is an email. http://www.powerfolder.com also if you have questions or need help let us know we will be glad to help you. Yvonne Renfrew Can both source and target folders be located on external devices (e.g., source = NAS and target = DROBO FX)? Or must one or both be located on the local drives of the computer itself? Bernhard Rutkowsky You can use any drive available to the server or via unc path ( nas ). It is not required to have the drive as local drive. Nitin Thakkar How does this compare to CrashPlan PROe which does not have any yearly fees ?